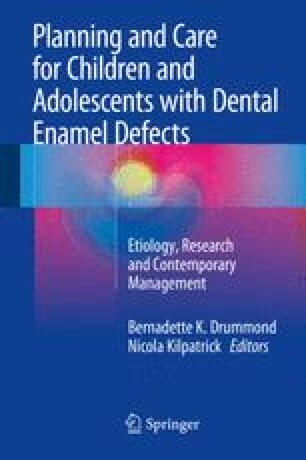 The prevalence of developmental defects of enamel (DDE) in the permanent dentition in developed countries has been reported to be in the range of 9–68 % and with no gender predilection. Several etiological factors have been implicated as being responsible for DDE in the permanent teeth. Although local, systemic, genetic or environmental factors have been attributed to DDE frequently they are likely to be multifactorial in nature. These factors are discussed in relation to the timing of enamel development with consideration of the evidence, or lack thereof, for the association between the putative etiological factors and the nature of the subsequent abnormalities.